Members of Phi Mu Alpha perform at a memorial service for Ananya Agrawal, a Weinberg senior who died Saturday night. More than 100 community members gathered in Alice Millar Chapel on Wednesday evening for the service. Music filled Alice Millar Chapel on Wednesday evening as community members gathered in memory of Ananya Agrawal, a Weinberg senior who died Saturday night. More than 100 students, faculty, administrators, alumni and family members came to the memorial hosted by the Phi Mu Alpha music fraternity, which Agrawal was a member of. On campus, Agrawal was also involved in the Northwestern University Marching Band for two years, and he recently received the Chemistry Department Scholar Award. Vice president for student affairs Patricia Telles-Irvin also spoke at the event after meeting with Agrawal’s family earlier in the day. Telles-Irvin described Agrawal as a “kind, empathic, brilliant, jovial person,” as well as a scholar, a generous friend and an innovator. 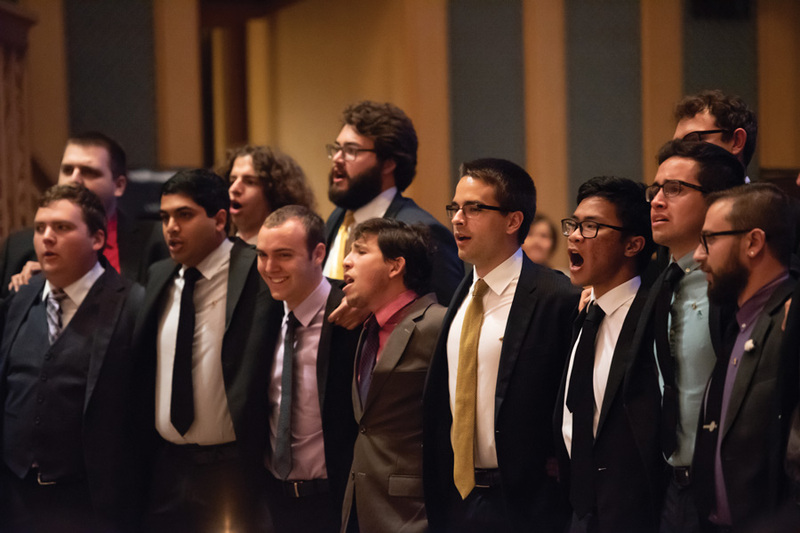 PMA members performed several songs in memory of Agrawal, including renditions of Blink-182’s “I Miss You” and the Northwestern University Alma Mater. McCormick senior and PMA member Tushar Chandra stressed how important music was to Agrawal — he sang in addition to playing the piano, bass guitar, drums and saxophone. Chandra said Agrawal’s commitment to music demonstrated his “determination and courage,” noting how he learned to play the saxophone so he could join NU’s marching band, despite never having been in a marching band. About 15 people spoke or performed at the service, including University Chaplain Tim Stevens. The memorial concluded with a performance from current and past PMA members, and closing remarks from Agrawal’s mother, Meenakshi Agrawal. She described her son’s many passions and talents. Meenakshi travelled from India to Evanston, and she said she was glad for the support her family received after arriving here. She added that she was grateful for the “honor and respect” the NU community gave her son. A previous version of this story misstated John Girotto’s year. Girotto is a fourth-year student. The Daily regrets the error.